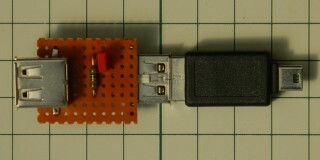 The adapter(s) above were used to cross-check power-to-input isolation where expected, or not, for some of the powered hubs. Column four has either when isolation was confirmed (LED not illuminated when a PSU connected to the hub) or when "back-powering" was possible (LED illuminated when a PSU connected to the hub). Whilst "back-powering" a Pi is reasonable if a single PSU is used to power both the Pi and the hub15, good isolation is necessary when separate (and similar) PSU's (one for the Pi, another for the hub) are used. The veroboard adapter part also includes a "track-break" to provide the necessary isolation of "back-powering" hubs for test purposes. See also USB Hub ID's etc. List.